Vinyl is for audio records right? Think again. While record players are all the rage amongst hipsters and die-hard music lovers, vinyl isn’t just for creating crisp sound waves. Luxury vinyl flooring is becoming popular because of its unique qualities that mimic the texture and appearance of other materials. 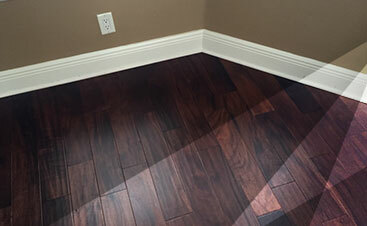 You can now have vinyl flooring installed that looks like genuine wood, but for the fraction of the cost! It’s also a great flooring solution for anyone who wants a floor that’s easy to maintain and clean. If you’re interested in having luxury vinyl floors installed in your Land O’ Lakes home, contact 2 Day Flooring for more information. Like laminate and tile, luxury vinyl flooring is resistant to moisture. It’s also resistant to stains, scratches, and denting. These qualities are great for areas of your home that see the most traffic, but they also allow vinyl to be installed anywhere and still look great. Consider it for more traditional areas like your kitchen, dining area, and bathrooms, but also think about how it might look in your family room or even bedrooms. Since it looks like authentic wood, you could place it anywhere you would consider installing hardwood and it will look just as beautiful. Luxury vinyl flooring also has a lot of options in appearance. You can choose from a variety of colors, patterns, styles, and textures. Not to mention, it’s incredibly affordable! You could pay half the price to install luxury vinyl flooring compared to other flooring materials. Whether you have a young child running around making messes, a pet that spills their food and water when they eat, or you like to rearrange your furniture regularly, luxury vinyl flooring can stand up against the spills, messes, bumps, and friction that happen in your Land O’ Lakes home. The material is resistant to forceful damage like scratches and dents, and is also resistant to physical damage like moisture and stains. Because of these qualities, luxury vinyl flooring is low maintenance and easy to clean. On top of these great benefits, luxury vinyl flooring is one of the most affordable flooring options available to you. Luxury vinyl flooring is similar-looking to other materials, but you can purchase it for half the price! 2 Day Flooring serves many locations in the Tampa area — Land O’ Lakes included! We are a Top Rated Local® flooring company because we offer amazing services at reasonable prices. Our flooring selection is one of the best; whether you want classic hardwood or authentic-looking vinyl, we have several options that you’ll love. We are committed to our customers’ satisfaction and will work with you to find the best flooring solution for your home, your lifestyle, and your budget. In Land O’ Lakes, you don’t have to settle for sloppy craftsmanship or long turnaround time on projects. 2 Day Flooring works quickly and diligently to install beautiful floors that will last you for years to come. 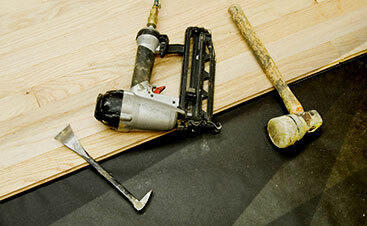 If you’re ready to start renovating your floors, contact 2 Day Flooring today!